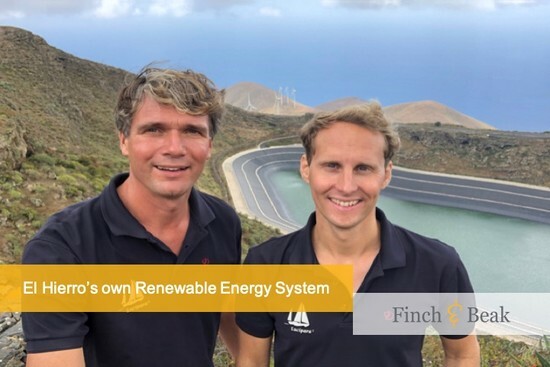 As part of their round-the-world sailing trip in search of sustainable solutions, the Sailors for Sustainability visited the Spanish island of El Hierro. Propelled by the northeast trade winds, the Sailors sail to the smallest of the seven main Canary Islands, which makes good use of the constant wind, too. Wind turbines generate a large part of the island’s electricity needs. Yet the Sailors come to see another element of the island’s energy system: the innovative way energy is stored to match supply and demand. How did the islanders manage to set a world-class example in renewable energy storage and what are the success factors? Former island council member and sustainability expert Javier Morales meets the Sailors on board. He explains that because of the long distance, no electricity cable was ever laid to mainland Spain. Instead, a diesel-fired power station supplied all the energy. Some fifteen years ago the island council went looking for a smart, renewable energy solution to become less dependent on expensive and polluting diesel. "Obviously, the preferred source of renewable energy here is wind. We get a lot of wind and the turbines don’t take a lot of space. That’s important because a lot of land here is allocated to nature reserves”, Javier clarifies. “Our challenge was to guarantee a constant supply of electricity for the 10,000 islanders, despite the intermittent nature of wind energy." The combined wind and hydro power plant is the first of its kind in the world. Curious to know more about the technical aspects of the island’s energy generation, the Sailors visit the energy company that manages the plant: Gorona del Viento, a public-private partnership of the El Hierro Island Council, Spanish energy company Endesa, and the Canary Islands Technological Institute. Communications officer Candelaria Sanchez explains that Gorona del Viento made use of existing technology. A building next to the lower water reservoir houses the turbines which generate the electricity from water falling from the upper to the lower reservoir. Another building around the corner houses the installations to pump the water back up to the upper reservoir. "The pumps are standard and the turbines are also used in many other hydroelectric power stations around the world", Candelaria states. Engineer Alberto Castaneda explains the plant’s significance and operation. Since its inauguration in 2015, the plant has generated an increasing part of the island’s energy needs with renewable means. “The reliability of delivery is of great importance to us”, Alberto explains. “Although the trade winds are fairly constant, the amount of energy generated still fluctuates considerably from second to second." He points to a large screen, which shows that real-time, varying energy production per wind turbine. "That's why we only put a small portion of the generated wind energy directly into the grid. Most of the energy is used to pump water to the upper reservoir. We regulate how much water is released for energy generation by the hydroelectric power plant, depending on the island’s electricity requirements at any given time." The old diesel generator still supplies the rest, but there is room for further improvement, Javier assures the sailors. “It is expected that the percentage of renewable energy in the electricity mix will increase even further as we keep getting better at managing the installations. The island’s real-time energy mix is publicly accessible, so you can check our progress." The Sailors ask Javier about the financials of the island’s remarkable energy transition. As member of the Island Council he was involved in the project. "It took 12 years of preparation, planning and fundraising,” Javier explains. “A total of € 80 million was invested. The European Union subsidized around half of that, the rest was funded by the consortium of public and private parties. The payback period for the private parties is expected to be nine years. After that period the island community will save a lot of money, which can be spent on other things, such as solar panels on roofs or electric transport. This would stimulate the local economy and enable the islanders to use 100% renewable energy throughout the year." The Sailors reflect on the island’s achievements. "It is no coincidence that a remote island has become a leading example of how to deal with the storage of renewable energy”, Ivar says. “They had to come up with a solution for the fluctuating power supply of wind energy because they had no connection with the mainland.” “But there is also a cultural element” Floris adds. “In the early 1980s, the island took its first environmental stance, opting for a development model based on respect for the island's heritage and conserving its natural resources. And in 1997, El Hierro was the first on the Canary Islands to adopt a sustainable development plan to protect its environmental and cultural richness, prompting UNESCO to declare the entire island a biosphere reserve in 2000. The community’s commitment to sustainable development have surely also contributed." The Sailors are impressed that such a small island community has managed to become such an inspiring example for the world. If that doesn’t give positive energy...! Sailors for Sustainability is formed by Dutch sailors Ivar Smits and Floris van Hees who chronicle their sailing trip around the world in search of sustainable solutions and examples of circular economy thinking. The goal is to inspire their followers with positive cases while raising awareness of the urgency of sustainable change. Using renewable energy sources such as wind and solar energy, they travel sustainably. Finch & Beak is involved as a partner of the project to share the insights gained by Sailors for Sustainability to inspire sustainable business transformation. More information about the sailors and their project can be found on the Sailors for Sustainability website.